At the time of this writing, Administrative Professionals Day is looming on the horizon. Many of the schools with which we work have events specifically designed for Administrative Professionals. Even if you’re NOT one of those schools, keep reading. Chances are you’ve got some sort of event, course, or program that fits the profile I’m about to lay out for you. The profile: a recurring event that could be attended by the same people each time it is offered. Whether an annual event, or a monthly event, the profile remains the same. Here’s the litmus test: if someone attended this event last year or month or quarter, would they want to attend again THIS year or month or quarter? Certainly the annual Administrative Professionals Day fits into that category. Perhaps you have a monthly wine club? A summer camp series? What about a program that requires re-certification every 2 years? I’m going to keep going with Administrative Professionals Day here. Replace that as you keep reading with whatever recurring events you have, okay? I see many schools that simply clone the last event in Lumens. The title is the same year after year. Doing this hampers your marketing efforts. Lumens Connect, your marketing platform, tracks the names of the classes or events that people register into through your Lumens account. 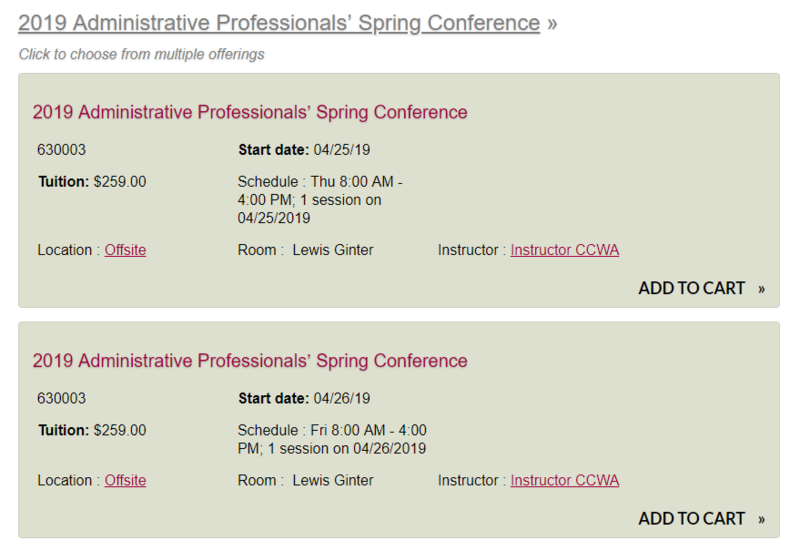 If you want to search for everyone who has ever registered for your Administrative Professionals Day event, you can do that easily. Do an advanced search on Cart Purchase [contains] Administrative Professionals. Done. That can be great for the FIRST email you send out to your list announcing this year’s event, but not so good for the second and third emails you’ll send. Why not? Because if the event is named the same year after year, you won’t be able to differentiate the people who have already registered for THIS year’s event. See what I mean? And you’ll be in the difficult position of sending emails to people suggesting that they do something that they have already done. Of course you can overcome this by exporting lists from Lumens for each year and uploading to Lumens Connect. It’s do-able, and it’s time consuming. Why do that when you can set yourself up from the start to make it easy on yourself? Name your recurring event, course, or program with an identifier in the title. Look at how CCWA, one of the Virginia Community Colleges, has handled their Administrative Professionals Day event for 2019. For the purposes of marketing for the 2020 event, it doesn’t matter WHICH session someone chose, only that they registered for the 2019 event, right? So you can easily send an email to an advanced search. Cart Purchase [contains] 2019 Administrative AND Cart Purchase [does not contain] 2020 Administrative. Now you have an advanced search that will only send subsequent emails to people who registered for LAST year but have not yet registered for THIS year. Because the advanced search runs at the time the email is processed to send (usually a little ahead of the scheduled send date/time), the search will always send to exactly that group – and if they registered an hour ago to attend this year, they won’t get the email. Because who likes getting asked to do something they’ve already done? Plus, it will be super-fast to write and send an email that says “We loved having you last time, and I’m not seeing your name on the list for this year. In case you missed it, here’s all the information.” How many more people would sign up if you could be that personal and specific? Or… “Hi Kurt, it’s time to re-up your certification. Here’s a link to the upcoming class you need.” See what I mean? What if your event is already a clone from the last time, without the unique identifier in the name? First, establish a go-forward plan. If you can rename the next recurrence of the event/course/program without repercussions, do it now. Then go back to Lumens and export the list of prior year attendees. You can upload them all to a single lead type (in which case your email will read “We loved having you join us in past years, and…” rather than “last year), or you can upload each list into its own lead type. If it were me, being the data nerd that I am, I’d upload the most recent past occurrence into its own lead type, then every time before that into one. Then at least you’ll know who attended last time, and can craft a quick email specifically for those folks. One last note – I know that, for some schools, the marketing team gets what the program managers give. I hope this can help you make the case that how things are in Lumens impacts the effectiveness and efficiency of your marketing. The one thing that EVERYONE has in common is that you want more classes at full capacity, right? If you’d like to talk about this in more detail, we can incorporate it into our next monthly meeting, or send me an email and we’ll get some time on the calendar.